For almost two days I willingly shadowed a top race (Cinderella) team competing in the 2015 Mark Hahn’s 300 mile pwc race billed as the “longest continuous race”. Four a.m. wake up call (day one) kicked off the start of our very long first day. I was somewhat disappointed that a certain Vietnamese friend failed to pack the much-anticipated homemade egg rolls. And so, it became a long drive from LA to Lake Havasu city, as we towed a borrowed 4×4 rhino. This rhino tows our race ski in and out of the water to refuel following three, four, or in some competitors case five laps around. Time it wrong and you run out of fuel and forfeit one lap after the slow tow in. Oftentimes this race is confused as the “longest” pwc race in the world. The fact that it is 300 miles long may be the deceiving factor. Competitors race within the confines of a three-point counterclockwise, give or take possibly a tenth or two of a ten-mile and somewhat oval water race course. Yes, I know the course is only ten miles; so in reality any pwc race in the world could stretch theirs to out distance the Mark Hahn 300. But why try? Where else in the world could pwc racers own a complete stretch of sandy desert beach like oasis of a spilled over river like the world-famous Colorado. And our weather this February 27/28, 2015 day, a desert dry 75-81 degree, with cinematic mountain views, clear blue skies with a cloud or two. To amaze the uninitiated, why just around the bend from race central (Crazy Horse Campground) is the actual world-famous London bridge. Taken apart brick and brick and brought here by an enterprising American by the name of John McCullough of the chainsaw world. The bridge was built on dry ground and then a canal was simply dug around it. The original granite was sold for the cost of the bridge and the once desert waste land suddenly became valuable as a Canadian snow bird oasis. Were I the Kim Jong ruler of the Lake Havasu World City, my first act would be that on the Mark Hahn 300 miler every rider would ride dependable McCullough turbo powered Kawasaki hulled racing machines. Racing every lap right under the London bridge. Millions of spectators, most in scantily clad bikinis would line its banks cheering wildly as past and present local racers like “the Stig”, Paul, Ralph, Carreon, Vanis, Roque, Bushong, Belton, Hoi, Lee, Walker, Friebe, Pirate, O’Side Bill, Young, Warner, Santiago, and countless world visitors compete. But, this is America, the land of the free and the brave, with the right to do, write or say most anything. No one gets to dictate what will and won’t work. The perfect racing machine that goes the distance – 300 miles fast, is still waiting to be built. For now, starting 40 teams is quite an accomplishment. May next year bring 50 teams to pwc racing. In the video below I unknowingly interviewed the 2015 winner from France, to the right of his start position a Kiwi, to his right Pat Roque of you guessed it team Pham/Roque, the team I shadowed. The start of the race and subsequent laps were led by #5, from Russia. Team Pham/Roque is possibly the template for how not to prepare for racing 300 miles. Anything pwc that gets race modified seems to be a breakdown waiting to happen. Whereby the Stig’s team is the template for how to outfit and race to win – sometimes! Purchase and outfit two complete race machines, one will always become a back up. Show up on race day and ride. How do the Russians, Kiwi, French or any of the other foreign competitors do it? In an attempt to go back to keeping this write-up light just watch the video below, titled antics of Team Pham/Roque. As a side note, Team Pham/Roque and yours truly are within a year or two of six decades on this planet. Besides having placed in the top ten in the past on this race and any other pwc offshore race we continue to bring a wide range of worldly experiences and accomplishments plus, some pretty entertaining value to this sport. Between Paul and I we brought in three doctors into this world. Yet, neither kid could care less about the race, unless of course, we met our untimely death on these or any other waters. Just a small reminder that racing anything is still serious business. The Mark Hahn is held in memory of an endurance racer who was instrumental in providing the momentum to keep endurance racing going strong and growing across the country before his untimely death during a PWC race in 2004. If you guessed that just possibly a “foreign accent” is involved – you guessed right. Perhaps some of our Kawasaki (Paul’s) or Seadoo’s (Pat) race boat woo’s can be attributed to some cultural language misspeaking or approach to racing. And if ever a television show depicted these two then the Wide World of Sports coined their phrase with the “agony of defeat”. In absence of facts, we have perception. There are things known and there are things unknown, and in between the doors are perception. And if this picture begs the question. Does it cost anything to race? Depends. If $700 for the first lap before a breakdown is too steep a price, then just maybe watching sports on TV is really the American way of saving a huge amount of cash. Or golf, or tennis or baseball. Who is making all the $$ anyway? Certainly not the racers. Following the short drive to Lake Havasu City I search for our race machine. It is still in pieces waiting for its turn up while two very hot looking (Kawasaki & Yamaha) turbo machines are receiving a final computer induced download. Paul’s Kawasaki turbo which he, don’t quote me, laid out approximately $4k for the turbo, plus about as much for the Motec hardware to tell it how much fuel and air to take in, simply blew up after a short test on the water. Nothing like waiting to the last minute for that extra bit of American induced adrenalin, or did it come from that recent Monster drink consumed? Pat’s Seadoo was this duo’s last hope. Enter N. Vannis with all the support provided a true friend could hope for. Spare prop, racing fuel, $4k Motec, truck, place to stay, no problems. But like they say, no good deed goes unpunished. While helping to off load the 50 gallon racing fuel drums from his super cool turbo diesel lifted 4×4 truck, a drum manages to drop right on his right foot’s small toe. See, I told you racing was safer than running the pits. So, what ever happened to the Havasu lady? Each year a really dolled up woman with every race pin imaginable on her vest and cowboy hat showed up. The annoying part to most people was the goose horn she sported and used often to start up the crowd. Sorry to say, I missed seeing her. Note to self: Don’t ever ride back with a guy who raced one good lap before his breakdown. He will simply try to keep reliving that moment over and over and over…. Worse part is he had the video to prove it. Note the GoPro above his helmet. “I get a really good start you know. “Oh so sad, I say, I thought you had a really bad start” NOOOO, I get a really really good start. I moved left onto clear water right away. I pass team Tony/Lee on the Kawasaki Turbo; next I pass Gerner #58 on his you guessed it, Kawasaki Turbo. Me – you broke Pat’s Seadoo. NOOO, so sad! The promoters were spot on in commending K38 Shawn Alladio for her support and sponsorship of count’em seven (7) military teams – NEVER QUIT CHALLENGE! 2011 was the last time I raced the Mark Hahn. #95 Perez/Walker The year my race partner managed to propel himself over the handlebars on his own race tricked out Seadoo. Thanks to his ability to finally bring the Seadoo back to the pits I was able to iron man it the rest of the way, and into 10th place overall. Also, the same year I loaned team Gerner/Carreon my Ultra’s ride plate to avoid a DNF. Another past memory of the Hahn is the year a competitor hit the scoring boat sending the only person with the computers password into the hospital with a minor coma. Then there was the time Kim B. came in to pit really really hot, flying right over the trailer and some say spectators. 2016 may also be the year that West Coast club throws down a competitive team; possibly challenging SoCal Watercraft club for the bragging rights. Wow. Have we got history. Hope to see you in 2016. As a competitor? A definite maybe. 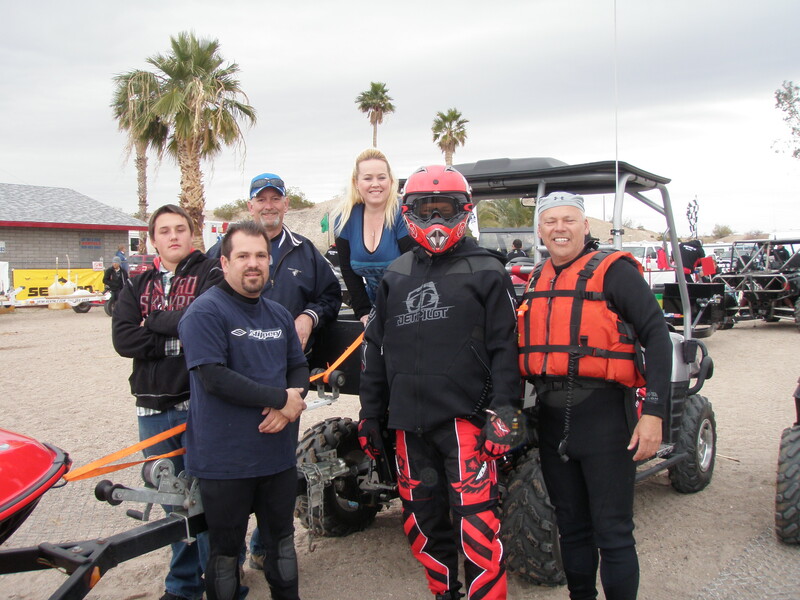 This entry was posted in Personal Watercraft, Uncategorized and tagged Kawasaki Turbo, Lake Havasu, Lake Havasu city, Mark Hahn, Pat Roque, water race course. Bookmark the permalink.